Ag-presenting dendritic cells (DCs) interpret environmental signals to orchestrate local and systemic immune responses. They govern the balance between tolerance and inflammation at epithelial surfaces, where the immune system must provide robust pathogen responses while maintaining tolerance to commensal flora and food Ags. The Wnt family of secreted proteins, which control epithelial and hematopoietic development and homeostasis, is emerging as an important regulator of inflammation. In this study, we show that canonical and noncanonical Wnts directly stimulate murine DC production of anti-inflammatory cytokines. Wnt3A triggers canonical β-catenin signaling and preferentially induces DC TGF-β and VEGF production, whereas Wnt5A induces IL-10 through alternative pathways. The Wnts also alter DC responses to microbe- or pathogen-associated molecular patterns, inhibiting proinflammatory cytokine induction in response to TLR ligands and promoting DC generation of Foxp3+ regulatory T cells. Moreover, although both Wnts suppress proinflammatory responses to bacterial endotoxin and to TLR1/2, TLR7, and TLR9 ligands, Wnt5A, but not Wnt3A, inhibits IL-6 production in response to the viral mimic, polyinosinic:polycytidylic acid. Thus, Wnt family members directly and differentially regulate DC functions, an ability that may contribute to the balance between tolerance and inflammation at epithelial sites of exposure to microbes and environmental Ags. Dendritic cells (DCs) process Ags and microenvironmental signals to control innate and adaptive immunity. They detect microbe and pathogen-associated molecular patterns (PAMPs) through pattern recognition receptors, including the TLRs. PAMPs trigger increased surface expression of MHC–Ag complexes and costimulatory molecules essential for the initiation of adaptive immune responses. TLR activation also induces cytokines and other immune stimulatory factors that regulate the recruitment and activation of innate immune cells and shape the adaptive immune response (1). However, DCs are also critical in maintaining tissue homeostasis by presenting self- and food Ags, as well as commensal microbe-derived products, in a tolerance-promoting context that depends, in part, on DC secretion of immune suppressive cytokines and on the generation of regulatory T cells (Tregs) (2). Dysregulated DC control of the balance between inflammatory and tolerogenic/homeostatic immune responses contributes to immunopathology in autoimmune disease and to mechanisms of immune diversion or escape in cancer. In this context, significant attention recently has focused on identification of microenvironmental factors that regulate the balance between proinflammatory and tolerogenic functions of DCs. The Wnt family of proteins regulates cell proliferation and differentiation in normal tissues and in cancer. Wnts are expressed in the intestine, lung, and skin (3, 4), where they are crucial for regulation of epithelial cell turnover, as well as in the bone marrow and thymus, where they regulate the development of cells of hematopoietic origin, including DCs (5). Wnts regulate the development of conventional DCs (cDCs) from monocytes or bone marrow precursors in vitro (6) and were reported to have both proinflammatory and anti-inflammatory effects on monocytes and macrophages (7–10). Studies based on the modulation of downstream Wnt-signaling molecules suggest a potential role for Wnts in DC function, as well: β-catenin, a multifunctional adaptor protein and transcriptional coactivator, is stabilized by canonical Wnt signaling and directs transcriptional activation of many Wnt-responsive genes. DC-specific deletion of β-catenin increased proinflammatory cytokine production and intestinal inflammation in mice (11). However, β-catenin activity is also regulated by cell adhesion and other Wnt-independent pathways: disruption of cell–cell contacts or mechanical agitation of DCs induces a tolerogenic DC phenotype dependent on signaling by β-catenin (12, 13). Moreover, Wnts can also activate β-catenin–independent “noncanonical” signaling mechanisms with both pro- and anti-inflammatory effects, depending on the cell context and experimental model (7, 9, 10, 14). Interestingly, a noncanonical Wnt controls a primordial mechanism for tolerance and resolution of inflammation in Drosophila (15). In this study, we assessed directly the effects of Wnts on the biology and functional responses of differentiated DCs. We report that Wnt3A and Wnt5A directly induce immunoregulatory cytokine production by differentiated DCs. Moreover, they redirect the DC response to PAMPs, suppressing DC activation and inflammatory cytokines while promoting Treg generation. 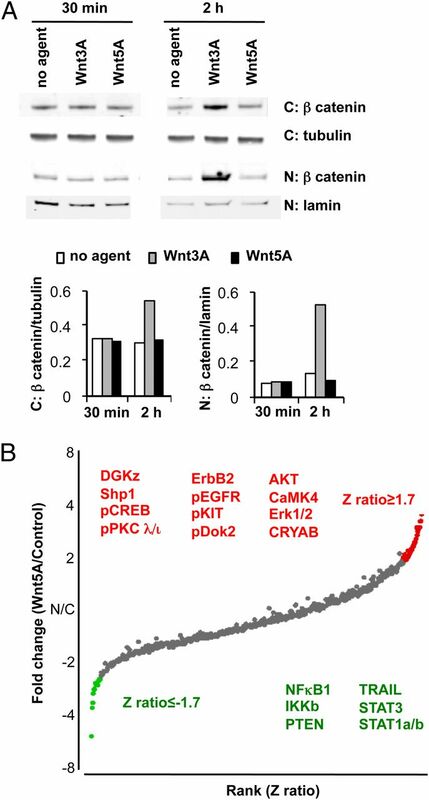 Consistent with their signaling in other cell systems, Wnt3A activates canonical β-catenin signaling in DCs, whereas Wnt5A triggers noncanonical signaling cascades. Although both Wnts support a tolerogenic DC phenotype, they induce distinct patterns of tolerogenic cytokine production and differential DC responses to TLRs. The results suggest an important role for the Wnt family in governing DC function and immune responses. C57BL/6 and B6.SJL/J mice were obtained from The Jackson Laboratory (Bar Harbor, ME) and bred in the Veterinary Medical Unit facility of the Veterans Affairs Palo Alto Health Care Systems. All animal studies were approved by the Institutional Animal Use and Care Committee, and experimentation was conducted in accordance with American Association for the Accreditation of Laboratory Animal Care guidelines. DCs were isolated from mesenteric lymph nodes (MLNs) and peripheral lymph nodes (PLNs) of 4–10-wk-old female or male C57BL/6 or B6.SJL/J mice by Collagenase IV digestion (250 U/ml; Worthington Biochemical, Lakewood, NJ) for 30 min at 37°C, followed by positive selection of CD11c+ cells using CD11c MicroBeads (Miltenyi Biotec, Bergisch Gladbach, Germany), according to the manufacturer’s instructions. In some experiments, we took advantage of the ability of the Flt3 ligand (Flt3L) to expand DC subsets in vivo with minimal alterations in their phenotypic or functional capabilities (16). C57BL/6 or B6.SJL mice were injected s.c. with 5 × 106 Flt3L-secreting B16 melanoma cells (hereafter termed “Flt3L-treated mice”) (17). After 14 d, MLNs and PLNs were harvested, and DCs were isolated by CD11c MicroBeads (Miltenyi Biotec). For some studies, CD11c+ DCs were further separated into total cDCs as Lin (CD3, CD19, NK1.1)−CD11c+B220− or CD103+ cDCs, Lin−CD11c+B220−CD103+, or plasmacytoid DCs (pDCs) as Lin−CD11c+B220+CCR9+ using a FACSAria. Spleen CD4+ T cells were isolated by positive selection using CD4 MicroBeads (Miltenyi Biotec). DCs (1–5 × 106 cells/ml) were cultured in complete RPMI 1640 supplemented with 10% FCS alone or in the presence of R837 (0.5 μg/ml), LPS (5 μg/ml), Pam3CSK4 (5 μg/ml), CpGA-ODN1585 (5 μg/ml), polyinosinic:polycytidylic acid [poly(I:C); 5 μg/ml] (all from InvivoGen, San Diego, CA), recombinant murine Wnt3A (PeproTech or R&D Systems, Minneapolis, MN), or recombinant human/mouse Wnt5A (R&D Systems). Cytokine secretion was determined at 20 h of culture by ELISA or Luminex analysis of culture supernatants. Expression of MHC class II (MHCII), CD80, CD86, and CCR7 was determined by FACS at 6 h of culture. For coculture experiments, DCs (4 × 106/ml) were pretreated for 5 h with medium alone, CpGA alone, or CpGA in the presence of Wnt3A or Wnt5A. Thereafter, cells were collected and washed extensively in complete RPMI 1640 prior to coculture with T cells. CD4+ T cells were labeled with CFSE (1 μM; R&D Systems) for 5 min at 37°C, followed by extensive washing, prior to culture. DCs (5 × 104/ml) and CD4+ T cells (1.25 × 105/ml) were cultured in the presence of anti-CD3 (0.5 μg/ml) alone or with anti-CD3 in combination with recombinant human TGF-β (2 ng/ml; R&D Systems), 2 ml/culture, in 24-well plates. On the last day of culture, cells were stimulated for 4 h with PMA (10 ng/ml) and ionomycin (1 μg/ml; both from Sigma-Aldrich, St Louis, MO) in the presence of brefeldin A (eBioscience) to enhance cytokine detection. Thereafter, cells were collected and stained with 7-aminoactinomycin D for the exclusion of dead cells and for the expression of CD4, followed by intracellular staining of cytokines and Foxp3. IFN-γ/TNF-α expression and frequency of Foxp3+ cells were determined by FACS on days 3 and 4 of culture, respectively. FACS analysis was performed on an LSR II flow cytometer. The following anti-mouse Abs and reagents were used for flow cytometry and cell stimulation: purified anti-CD16/CD32 (24G2), FITC anti-CD3 (145.2C11), FITC anti-CD19 (1D3), FITC anti-NK1.1 (PK136), Pacific Blue anti-CD11c (N418), PerCp-Cy5.5 anti-B220 (RA3-6B2), allophycocyanin anti–IFN-γ, PE anti–TNF-α, Pacific Blue anti-CD4 (RM4-5), Alexa Fluor700 anti-MHCII (M5/114.15.2), PE anti-CD80 (16-10A1), PE anti-CD86 (GL1), purified anti-CD3 (145.2C11), PE-Cy7 streptavidin, and 7-aminoactinomycin D (all from BD Biosciences); FITC anti–Siglec H (eBio440c), biotin anti-CD103 (2E7), PE anti-CD103 (2E7), allophycocyanin anti-CCR7 (4B12), PE anti-Foxp3 (FJK-16) (all from eBioscience); and allophycocyanin anti-CCR9 (242503) (R&D Systems). The following reagents were used for ELISA: mouse IL-6 ELISA set, mouse IL-12p40 ELISA set, mouse TNFα ELISA set, mouse IL-10 ELISA set (BD Biosciences), and mouse VEGF ELISA set (R&D Systems). IFN-α ELISA was performed using anti μ–IFNα (Rmma-1) as capture Ab and rabbit-PAb against μ–IFN-α for detection (PBL InterferonSource, Piscataway, NJ). Primary Abs used for Western blot analysis were rabbit monoclonal anti-mouse β-catenin (6B3; Cell Signaling Technology, Danvers, MA), mouse monoclonal anti-tubulin α Ab-2 (DM1A; NeoMarkers, Fremont, CA), and goat polyclonal anti-lamin B (Santa Cruz Biotechnology, Santa Cruz, CA). Secondary Abs used were Alexa Fluor 680 donkey anti-rabbit IgG (Molecular Probes, Eugene, OR) and IRDye 800CW donkey anti-mouse IgG (LI-COR Biosciences, Lincoln, NE). Mouse 26-plex kits were purchased from Affymetrix and used according to the manufacturer’s recommendations with modifications, as described below. Briefly, samples were mixed with Ab-linked polystyrene beads on 96-well filter-bottom plates and incubated at room temperature for 2 h, followed by overnight incubation at 4°C. Plates were vacuum filtered and washed twice with wash buffer and then incubated with biotinylated detection Ab for 2 h at room temperature. Samples were then filtered and washed twice, as above, and resuspended in streptavidin-PE. After incubation for 40 min at room temperature, two additional vacuum washes were performed, and the samples were resuspended in reading buffer. Plates were read using a Luminex 200 instrument with a lower bound of 100 beads/sample/cytokine. Nuclear and cytoplasmic protein fractions were prepared using the Nuclear Extract Kit (Active Motif), according to the manufacturer’s instructions, from Flt3L-treated mouse lymph node CD11c+ DCs (5 × 106 cell/ml) cultured in the presence or absence of Wnt3A or Wnt5A (0.3 and 3 μg/ml) for 30 min and 2 h. Protein concentration was determined with the BCA protein assay kit (Pierce), and 10 μg protein was resolved on 4–12% NuPAGE Bis-Tris Mini Gels (Life Technologies) and transferred to Immobilon-FL transfer membrane (Millipore). Membranes were blocked in Odyssey blocking buffer (LI-COR Biosciences) and probed with Abs for β-catenin (1/1000), tubulin (1/2000), and lamin B (1/2000), and proteins were detected using the Odyssey CLx imaging system (LI-COR Biosciences). Signal intensity was analyzed with Image Studio software. Preparation of protein samples was completed according to standard Kinexus recommendations (http://www.kinexus.ca/services). Samples were prepared from lymph node DCs of Flt3L-treated mice cultured at 5 × 106 cell/ml for 30 min with 3 μg/ml Wnt5A or with control media. Analysis of the data was carried out by C. Laudanna and Simone Zorzan (Università di Verona, Verona, Italy) in a modification of the standard Kinexus analytics and of applications of Z transformation to microarray studies (18). Z scores (a measure of the amount of change of the signal in relation with its SD) were calculated from the Kinexus logarithmic “log2” read values on the basis of the SD of replicates relative to Abs with good read (flag = 0 in both the physical replicates). Abs with poor reads (flag = 1) were excluded. Z ratios are calculated as differences between Z scores on control and Wnt5A-treated samples. A percentage error value was obtained as percentage ratio between average and SD on the two good physical replicas of each probe. Proteins that met the following criteria were highlighted as candidate proteins changed by Wnt5A signaling: Z ratios ≥1.7 or ≤−1.7, maximum percentage error between the two physical replicas of the probe (as calculated above) <20%, and ≥2-fold change in mean value induced by Wnt5A treatment. Data are presented as mean values ± SEM, unless otherwise indicated. Statistical significance between sets of data was assessed with the two-tailed unpaired Student t test. DCs express genes encoding several Wnt receptors and downstream Wnt effector molecules (11, 19) (http://www.immgen.org), suggesting that DCs have the machinery to respond to Wnts. 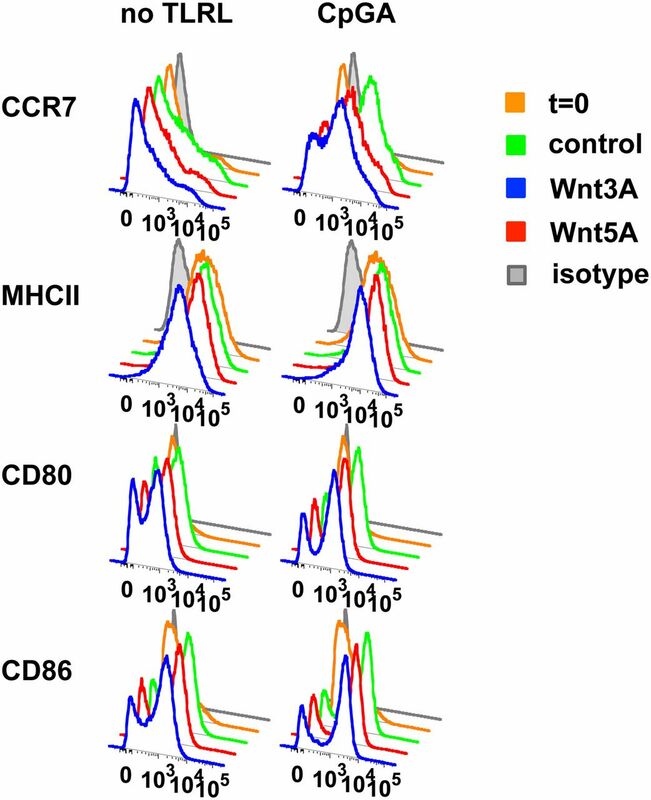 To determine whether Wnts directly affect differentiated DCs, we assessed the ability of Wnt3A and Wnt5A to induce cytokine production in freshly isolated CD11c+ DCs from mouse lymph nodes. Overnight stimulation of DCs with recombinant Wnt3A or Wnt5A stimulated secretion of the immune regulatory cytokine TGF-β. 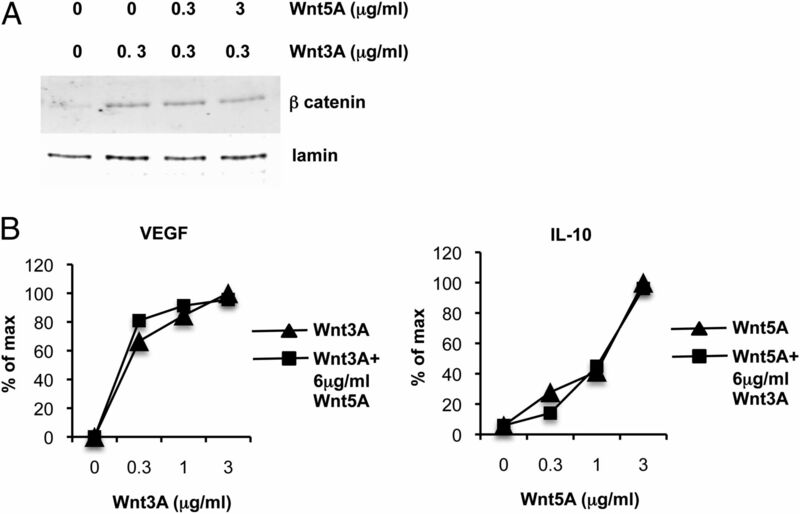 The levels induced by Wnt3A were higher than those induced by Wnt5A (Fig. 1A). Interestingly, Wnt5A (but not Wnt3A) also induced IL-10, whereas Wnt3A (but not Wnt5A) strongly induced VEGF-A, an angiogenic growth factor that was recently implicated in immune regulation, as well (20–22) (Fig. 1A). Not all cytokines were modulated: constitutive low or undetectable expression of MCP-1 (CCL2), MCP-3 (CCL7), IP-10 (CXCL10), G-CSF, GM-CSF, IFN-γ, IL-1α, IL-1β, IL-12p70, IL-5, and IL-13 was not affected by the Wnts (data not shown). Thus, Wnts directly and selectively promote DC production of immune regulatory cytokines. Wnt3A and Wnt5A differentially stimulate tolerogenic cytokine production in resting DCs. Isolated CD11c+ DCs from pooled PLNs and MLNs were stimulated in vitro with Wnt3A (3 μg/ml) or Wnt5A (3 μg/ml) for 20 h. Cytokine secretion was determined by multiplex Luminex analysis (VEGF and TGF-β) or ELISA (IL-10) of culture supernatants. Results are presented as mean ± SEM (n = 3). DCs were from normal mice (n = 2, TGF-β and VEGF) or Flt3L-treated mice (n = 1, TGF-β and VEGF; n = 3, IL-10). Wnt5A, but not Wnt3A, also induced an increase in IL-10 from normal mouse lymph node DCs in an independent experiment (data not shown). p < 0.01 for VEGF, p < 0.05 for TGF-β induction (Wnt3A versus control), p < 0.004 for IL-10 (Wnt5A versus control). TLRs activate DCs to produce proinflammatory cytokines and chemokines. We assessed the effects of the Wnts on TLR responses of DCs from normal mouse lymph nodes and from lymph nodes of mice in which DC populations were expanded with Flt3L, as previously described (17). DCs were stimulated overnight with TLR ligands in the presence or absence of recombinant Wnt3A or Wnt5A. Both Wnts effectively suppressed LPS-induced IL-6 and MIP-1α (CCL3) production by normal lymph node DCs and reduced TNF-α (Fig. 2A). IL-12p40 production was reduced, as well, in DCs from normal mice (although not in in vivo Flt3L-expanded DCs, which otherwise behaved similarly to DCs from untreated mice; see below). In contrast, Wnt3A induced secretion of VEGF, and both Wnts induced secretion of TGF-β in the presence of LPS (Fig. 2A). There was little or no effect on LPS-induced secretion of RANTES (CCL5). IFN-γ, IL-1β, IL-1α, CCL2, CCL7, CXCL1, GM-CSF, IL-12p70, and IL-13 were not significantly induced by TLRs or Wnts (data not shown). Moreover, Wnt inhibition of TLR-stimulated IL-6 was not limited to LPS responses: both Wnts also suppressed induction of IL-6 by total DCs in response to the TLR9 ligand CpGA (Fig. 2B). Wnts suppress TLR-induced proinflammatory cytokine production. (A) Effect of Wnts on LPS responses of DCs from normal mouse lymph nodes. CD11c+ DCs were stimulated in vitro with LPS (5 μg/ml) in combination with Wnt3A (3 μg/ml) or Wnt5A (3 μg/ml) for 20 h. Cytokine secretion was determined by multiplex Luminex analysis of culture supernatants. Data represent cytokine concentrations from one of two experiments performed with similar results. (B) Wnts inhibit CpG, as well as LPS, stimulation of IL-6 in DCs. CD11c+ DCs isolated from pooled lymph nodes from normal mice were stimulated in vitro with LPS (5 μg/ml) or CpGA (5 μg/ml) in combination with Wnt3a or Wnt5a (3 μg/ml) for 20 h. Cytokine secretion was determined by ELISA. Data are mean (± SEM) cytokine concentrations from three to five experiments. Symbols represent individual experiments. (C) Dose-dependent Wnt effects on TLR responses. Total FACS-sorted cDCs (CD11chigh, B220−) or CD103+ cDCs (insets) isolated from MLNs (IL-6, IL-12p40 and IL-10 graphs) or total CD11c+ DCs isolated from pooled lymph nodes (VEGF-A and IFN-α graphs) of FLT3L-treated mice were stimulated in vitro with LPS (5 μg/ml), CpGA (5 μg/ml), or Pam3CSK4 (5 μg/ml) in the presence of various doses of Wnt3A or Wnt5A for 20 h. Cytokine secretion was determined by ELISA of culture supernatants. For IL-6, IL-12p40, and IFN-α, data are presented as the percentage of cytokine concentration in the presence of TLR alone, without Wnt. (In the absence of Wnts, values [pg/ml] were as follows: IL-6 [for Wnt3A] LPS 820, CpGA 3,400, Pam3CSK4 730; IL-6 [for Wnt5a] LPS 670, CpGA 4,150, Pam3CSK4 660; IL-12p40 [for Wnt3A] LPS 18,310, CpGA 25,220, Pam3CSK4 18,900; IL-12p40 [for Wnt5A] LPS 16,550, CpGA 32,140, Pam3CSK4 13,530; and IFN-α in units/ml [for Wnt3A and Wnt5A] 1650.) For IL-10 and VEGF-A induction, data are the percentage of maximum cytokine concentration induced by each TLR ligand or control. (Maximum values [pg/ml] were as follows: IL-10 medium 80, LPS 120, CpGA 110, Pam3CSK4 240; VEGF-A medium 22,580, LPS 20,940, CpGA 17,100.) Mean ± SEM are shown (n = 3), with the exception of IL-12p40 and IFN-α in response to CpGA, as well as VEGF-A in response to all stimulations, mean ± SD (n = 2). CD103+ DC responses (insets) are from one of two experiments with similar results. In studies with FACS-purified cDCs (CD11chigh B220−) from Flt3L-treated mice, both Wnts suppressed IL-6 secretion in response to LPS, CpGA, R837 (imiquimod), and the TLR1/2 ligand Pam3CSK4 (Fig. 2C). TLR stimulation of IL-12p40 production was unaffected. Under the same culture conditions, Wnt5A induced IL-10 secretion similarly in the presence or absence of TLR stimulation (Fig. 2C). 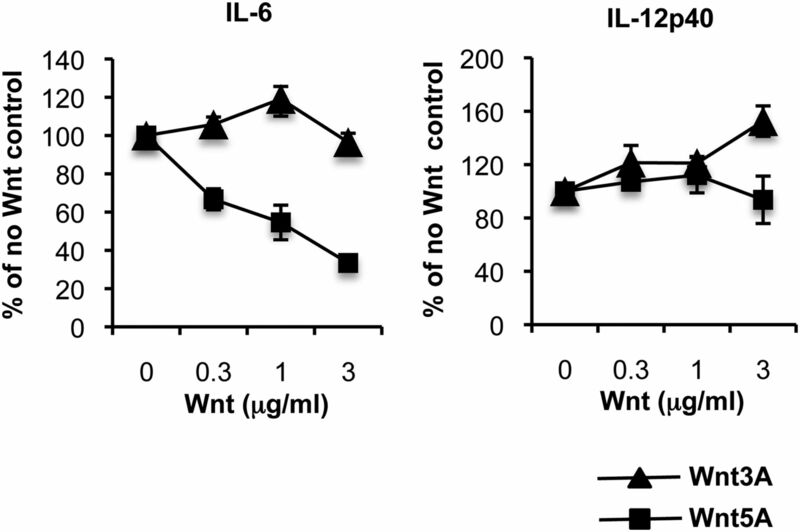 Wnt inhibition of IL-6 and induction of IL-10 were dose dependent. Both Wnts also inhibited IFN-α secretion induced by CpGA stimulation (Fig. 2C). We also assessed the effects of Wnts on the responses of CD103+ cDCs (CD11chighB220−CD103+ cells), a subset implicated in mucosal immunity and immune regulation (23). The Wnts suppressed TLR-induced IL-6 and increased IL-10 production by CD103+ cDCs to a similar extent as observed for total cDCs (Fig. 2C, insets). Both Wnts also inhibited secretion of IL-6 and TNF-α by sorted CD11c+B220+CCR9+ pDCs stimulated with the pDC-selective TLR7 ligand R837 (data not shown; IL-10 was not analyzed in pDCs). Although we cannot exclude other subset- or Wnt protein–specific effects, the results suggest that inhibition of TLR-induced proinflammatory cytokines and induction of suppressive cytokines may be a common feature of Wnt–DC interactions. Interestingly, the two Wnts displayed distinct effects on DC responses to the viral RNA mimic poly(I:C): Wnt5A efficiently suppresses poly(I:C)-stimulated IL-6 secretion, whereas Wnt3A does not (Fig. 3), indicating a unique ability of Wnt3A to differentiate between PAMPs. Differential effects of Wnt3A and Wnt5A on poly(I:C)-induced IL-6 production. cDCs (CD11chigh, B220−) FACS sorted from MLNs of Flt3-treated mice were stimulated in vitro with poly(I:C) (5 μg/ml) in the presence of Wnt3A or Wnt5A. Supernatants were collected at 20 h of culture and analyzed by ELISA to determine the concentration of secreted cytokines, which is presented as the percentage of cytokine concentration in the presence of TLR alone, without Wnt. (Cytokine concentration in the absence of Wnt: IL-6 [for Wnt3A] 1,100 pg/ml; IL-6 [for Wnt5A] 1,000 pg/ml; IL-12p40 [for Wnt3A]) 19,160 pg/ml; IL-12p40 (for Wnt5A) 12,800 pg/ml.) Results are presented as mean ± SEM (n = 3 for IL-6) and mean ± SD (n = 2 for IL-12p40). Whether activated by PAMPs or by tolerogenic stimuli, such as “cluster disruption” or mechanical manipulation, mature DCs are characterized by increased surface display of MHCII–peptide complexes and costimulatory molecules (i.e., CD86, CD80), as well as expression of the chemokine receptor CCR7 that allows migrating DCs to exit tissue sites of Ag uptake and migrate to draining lymph nodes. Together, these features are required for efficient presentation of Ags to T cells in the draining lymph node, whether for tolerance or immune stimulation. In our experiments, we isolated DCs from lymph nodes of Flt3L-treated mice using positive selection with CD11c-conjugated beads, a process that initiates in vitro maturation without inducing inflammatory cytokines (12, 13). Isolated DCs were cultured in medium alone or in the presence of TLR9 ligand CpGA, with or without Wnt3A or Wnt5A, as above. Cultured DCs rapidly upregulated MHCII, CD80, CD86, and CCR7 in medium alone and further in response to CpGA. Importantly, Wnts had no effect on MHCII and costimulatory molecule induction, and it only minimally reduced CCR7 upregulation (Fig. 4). Thus, Wnts upregulate immune regulatory cytokines without inhibiting DC maturation, allowing development of a mature tolerogenic DC phenotype. Wnts do not prevent DC maturation. CD11c+ DCs isolated from pooled lymph nodes of Flt3L-treated mice were cultured in medium alone or with CpGA (5 μg/ml) in the presence of Wnt3A (2 μg/ml) or Wnt5A (2 μg/ml). Cells were analyzed by FACS at 6 h of culture. Expression of CCR7, MHCII, CD80, and CD86 was determined for cDCs, gated as CD11c+ Siglec H− cells. Data are from one of two experiments performed with similar results. To determine whether Wnt preconditioning alters the effects of DCs on T cells, we stimulated DCs with TLR ligand, either alone or in combination with Wnts, as before. After extensive washing, the conditioned DCs were used as stimulators in secondary cultures with CD4+ T cells and anti-CD3. Wnt+CpG-preconditioned DCs generated a 50–75% decreased frequency of IFN-γ–producing T cells, whereas the generation of TNF-α–producing cells was only marginally reduced by Wnt5A, and overall T cell expansion was unaffected compared with control DCs preconditioned with TLR ligand alone (Fig. 5A). Pretreatment of DCs with Wnt alone, in the absence of TLR ligand, did not alter their ability to promote basal levels of T cell proliferation and showed only slight and variable (nonsignificant) inhibitory effects on IFN-γ production compared with medium control–treated DCs (Supplemental Fig. 1, data not shown). To examine the effects of Wnts on TLR-stimulated DC induction of Tregs, we included TGF-β in the secondary cocultures. Wnt+CpG-pretreated DCs generated a much higher frequency of Foxp3+ Tregs compared with control DCs preconditioned with TLR alone (Fig. 5B). Consistent with the known Treg-promoting effect of TGF-β, there was minimal generation of Tregs by CpGA- or medium control–stimulated DCs in the absence of exogenous TGF-β, and this was not enhanced significantly by Wnts (Fig. 5B, Supplemental Fig. 1). Thus, although the levels of TGF-β induced by Wnts in DCs were insufficient to promote expansion of Tregs under the in vitro conditions used in this study, there was a clear synergy of Wnt+TLR ligand–preconditioned DCs with TGF-β, resulting in increased Treg generation and reduced expansion of Foxp3− CD4+ T cells (Fig. 5B, Supplemental Fig. 1). Addition of neutralizing anti-Wnt5A Ab (10 μg/ml) to the secondary cocultures had no effect on Foxp3+ T cell generation by Wnt5A+CpG-preconditioned DCs, ruling out a direct effect of residual Wnt on T cells (data not shown). Altered T cell responses to DCs stimulated with CpG in the presence of Wnts. CD11c+ DCs isolated from pooled lymph nodes of Flt3L-treated mice were stimulated in vitro for 5 h with CpGA (5 μg/ml) in the presence of Wnt3A (3 μg/ml) or Wnt5A (3 μg/ml). Cells were washed extensively and cocultured with spleen-derived CFSE-labeled CD4+ T cells in the presence of anti-CD3 (0.5 μg/ml) alone (A, left panels in B) or anti-CD3 and TGFβ (2 ng/ml; right panels in B). On day 3 of culture, T cells were analyzed by FACS for proliferation and expression of cytokines (A); on day 4, they were analyzed for frequency of Foxp3+ cells (B). Intensity of CFSE and expression of IFN-γ, TNF-α, and Foxp3 was determined among gated CD4+ T cells. Dot plots are from one of three experiments performed with similar results. Bar graphs show the mean and range (n = 2 for IFN-γ) or mean ± SEM (n = 3 for Foxp3). Wnt3A treatment of DCs induced accumulation and translocation of β-catenin from the cytoplasm to the nucleus (Fig. 6A), consistent with its well-characterized activation of canonical Wnt signaling in other cell systems (24). In contrast, Wnt5A failed to alter β-catenin levels or affect its nuclear translocation in isolated DCs. To confirm an effect of Wnt5A on DC intracellular signaling, analysis of proteins affected by Wnt5A was carried out using Kinex protein microarrays that interrogate >800 proteins and phosphoproteins (Fig. 6B, Supplemental Table I). Comparison of control untreated and Wnt5A-treated CD11c+ DCs revealed effects on multiple signaling molecules, including components of calcium, MAPK, growth factor, NF-κB, PKC, and cytokine STAT pathways (Fig. 6B). Interestingly, several of the modulated proteins have been implicated in IL-10 regulation, with the potential to contribute to Wnt5A induction of IL-10 in DCs (see Discussion), and others are known moderators of proinflammatory NF-κB signaling. We conclude that Wnt5A triggers significant alterations in intracellular signaling molecules in DCs. Signaling by Wnt3A and Wnt5A. (A) Western blot analysis reveals nuclear translocation of β-catenin in response to Wnt3A, but not Wnt5A, treatment of DCs. CD11c+ DCs isolated from lymph nodes of Flt3L-treated mice were treated with Wnt3A (0.3 μg/ml) or Wnt5A (0.3 μg/ml) for 30 min and 2 h. Data shown include Western blots of β-catenin in the cytoplasmic (C) and nuclear (N) fractions and loading controls; tubulin (cytoplasmic) and lamin B (nuclear), and are representative of one of three independent experiments with similar results. (Treatment with 3 μg/ml Wnt3A or Wnt5A gave similar results [data not shown]). (B) Protein-expression analysis using Kinex Ab microarrays comparing control and Wnt5A-treated DCs. Positive or negative fold-changes in protein or phosphoprotein expression after 30 min of treatment of DCs with 3 μg/ml Wnt5A are plotted versus rank order of Z scores. Proteins with Z ratios ≥1.7 or ≤−1.7 and whose intensity was increased or decreased ≥2-fold are shown in red or green and are listed in Supplemental Table I. Significantly affected proteins with potential roles in IL-10 induction, modulation of inflammatory or growth/survival mechanisms are highlighted in red (upregulated) or green (downregulated) text. In hematopoietic stem cell differentiation and in colon cancer cells, noncanonical signaling triggered by Wnt5A counteracts and inhibits β-catenin activation by canonical Wnts (25, 26). However, in DCs, Wnt5A failed to inhibit or alter Wnt3A induction of VEGF, and it did not inhibit Wnt3A-induced β-catenin translocation (Fig. 7). Moreover, excess Wnt3A had no effect on Wnt5A-induced IL-10 secretion (Fig. 7). These findings underscore the specialized nature of DC responses to Wnt signaling. Wnt5A does not counteract Wnt3A-induced β-catenin signaling or VEGF secretion nor does Wnt3A affect Wnt5A-induced IL-10 secretion. CD11c+ DCs from pooled lymph nodes of Flt3L-treated mice were treated with Wnt3A or Wnt5A or Wnt3A in combination with Wnt5A at the indicated concentrations. (A) DCs were cultured for 2 h, and nuclear extracts were analyzed by Western blot for β-catenin and for lamin B as a loading control. Data shown are representative of three independent experiments with similar results. (B) DCs were cultured for 20 h, and supernatants were analyzed by ELISA to determine the concentration of secreted cytokines. Results are presented as the percentage of maximum cytokine concentration induced. Maximum values were 120 pg/ml for IL-10 and 4200 pg/ml for VEGF-A. Data shown are representative of two independent experiments with similar results. We showed that Wnts stimulate DC production of anti-inflammatory cytokines and reprogram DC responses to a wide range of microbial ligands. Wnt3A and Wnt5A, two Wnts with opposing effects in many cellular systems, differentially induce immune regulatory cytokines but share a common ability to inhibit proinflammatory DC responses. Brief pretreatment with Wnts during TLR stimulation further altered DC function to promote Foxp3+ Tregs while limiting generation of IFN-γ–producing effector T cells, suggesting that Wnt reprogramming of DCs can be translated into tolerogenic effects on the adaptive immune response. For our studies, we chose to examine Wnt3A as a representative Wnt that characteristically activates the canonical β-catenin pathway and Wnt5A, which, in most cell systems, mediates noncanonical signaling (24). Both Wnts induced tolerogenic changes in DCs, but the responses that they produced were distinct. In studies of primary or in vivo Flt3L-expanded lymphoid tissue–derived DCs, both Wnts stimulated immune regulatory cytokines, but Wnt3A preferentially induced TGF-β, whereas Wnt5A was a potent stimulus for IL-10 production. Wnts also induce TGF-β in fibroblasts (27), and although Wnt induction of IL-10 has not been reported, to our knowledge, Gsk3β inhibition or β-catenin signaling stimulates IL-10 production in TLR-activated human monocytes (28) and T cells (29). 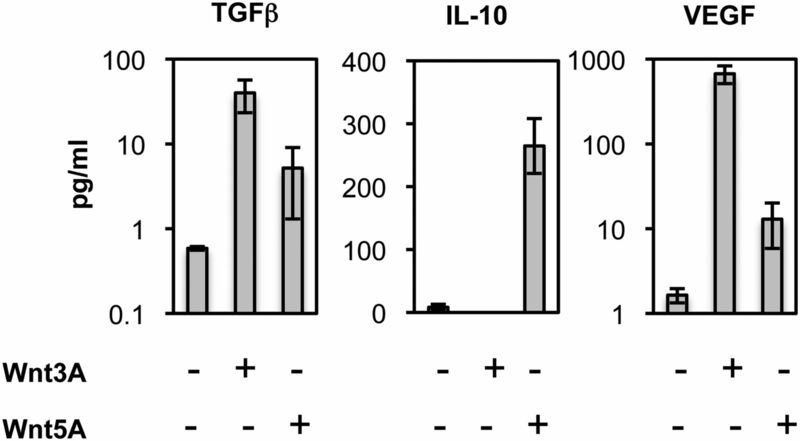 TGF-β and IL-10 are critical participants in the maintenance of tolerance and immune homeostasis, acting on innate immune and stromal cells to suppress production of proinflammatory cytokines/chemokines and modulate downstream adaptive immune responses (30). They also have important functions in protection at mucosal surfaces: IL-10 acts on epithelial cells to promote epithelial barrier integrity (31), and TGF-β stimulates IgA production (32, 33) and acts on T cells to support the generation and survival of peripheral Foxp3+ Tregs (34, 35); whether the TGF-β is secreted in biologically active form in this setting remains to be determined. Interestingly, Wnt3A, but not Wnt5A, strongly stimulated DC production of VEGF-A, as well. Wnt3A was reported to upregulate VEGF in osteoblasts (36) and retinal epithelial cells (37) via the canonical β-catenin–dependent pathway. In addition to its established role in angiogenesis, VEGF has recently emerged as an immune regulatory cytokine. VEGF produced in the tumor microenvironment inhibited the proinflammatory maturation of DCs (20) and generated an increased frequency of Tregs (22), and it can directly suppress T cell activation through VEGFR-2 (21). Thus VEGF expression by Wnt-stimulated DCs may play an immune regulatory role complementing those of IL-10 and TGF-β. In addition to these effects on basal DC activity, the Wnts effectively reprogram DC responses to PAMPs. Both Wnt3A and Wnt5A inhibit the induction of the proinflammatory cytokines IL-6, MIP-1α (CCL3),TNF-α, and IFN-α in response to TLR ligands. Interestingly however, Wnt5A suppresses IL-6 secretion in response to the viral mimic poly(I:C), just as to other TLR ligands, but Wnt3A does not. Thus, Wnt3A can differentiate between PAMPs, allowing DC proinflammatory responses to poly(I:C) while suppressing responses to other TLR ligands. Poly(I:C) is a synthetic dsRNA that mimics RNA virus infections and initiates cellular responses through TLR3, Rig-1, and MDA-5. The selective ability of Wnt3A-treated DCs to produce proinflammatory IL-6 in response to poly(I:C) may allow a particularly aggressive immune response to RNA viruses in environments containing Wnt3A or related Wnt family members that signal via the canonical pathway (see below). Wnt3, a close structural and functional paralog of Wnt3A, is selectively expressed by Paneth cells of the crypt epithelium in the intestines where epithelial stem cells reside (38, 39). Wnt3 may allow rapid responses of crypt-associated DCs to RNA viruses infecting the proliferating epithelial cell compartment, while still inhibiting responses to non-PAMP molecules. In contrast, Wnt5A is expressed by unidentified mesenchymal cells in the intestinal lamina propria, especially in the apical region of the lamina propria (39), and by fibroblastic reticular cells in lymphoid tissues (19). Together, the results suggest the potential for sophisticated control of DCs by Wnts as a function of their microenvironmental localization. In contrast to their inhibition of proinflammatory cytokine production, the Wnts did not inhibit culture-induced or TLR-stimulated DC upregulation of costimulatory molecules required for efficient T cell interactions. Moreover, they only had a minor inhibitory effect on upregulation of CCR7, which mediates DC migration from tissues into draining lymph nodes. These hallmarks of DC maturation are required for DC Ag presentation in vivo whether for tolerance or immune activation. Thus, the Wnts permit efficient DC maturation while reprogramming their basal and TLR-induced cytokine responses. In accordance with their tolerogenic phenotype, both Wnt3A- and Wnt5A-preconditioned DCs supported enhanced generation of Tregs while inhibiting the generation of IFN-γ–producing Th1 cells during in vitro T cell coculture. This effect is seen in the context of TLR stimulation and, in our in vitro coculture setting, required exogenous TGF-β, revealing a synergistic effect of Wnts and TGF-β in DC generation of Tregs. IL-6 is known to suppress TGF-β–induced Treg expansion while favoring inflammatory effector responses in the presence of TGF-β (40). Both Wnt3A and Wnt5A potently reduce TLR-induced IL-6 production, and it is likely that their stimulation of the Treg response reflects this suppression of DC IL-6 secretion. Consistent with its well-established role as a canonical Wnt in other cell systems, Wnt3A induced the accumulation and nuclear translocation of β-catenin in DCs. As outlined above, β-catenin signaling is now well established as a mediator of tolerogenic DC maturation (11–13). Although Wnt5A failed to stimulate β-catenin, protein array analysis was consistent with effects on multiple signaling pathways in Wnt5a-treated cells. Alterations were observed in calcium- (e.g., CAMK4, DGKz), PI3K- (PTEN and AKT), MAPK-, and NF-κB–signaling components. Several of the changes observed in Wnt5A-treated DCs have been associated with anti-inflammatory responses in other cell types or settings. For example, mediators of inflammatory gene regulation, including STAT1a/b, STAT3, PTEN, and TRAIL, were downregulated, as were proteins associated with activation of NF-κB (NFκBp50 and IKKβ), a key mediator of inflammatory responses (41). In contrast, several upregulated proteins have been implicated in anti-inflammatory responses [e.g., heat shock protein-ab-crystallin, protein tyrosine phosphatase Shp1 (42), and phospho-Dok2 (43)]. Several Wnt5A-upregulated or -activated proteins have been implicated in the positive regulation of IL-10, as well, including Shp1 (42), AKT (44), Erk1/2 (45), the atypical PKCι/λ (46), and phospho-CREB, which can bind the IL-10 promoter and positively regulate its transcription in response to Erk and AKT signaling (45). In addition to immune-responsive proteins, changes were observed in several signaling molecules involved in growth/survival; EGFR, ErbB2, phospho-KIT, AKT, and Erk1/2 were upregulated, whereas proapoptotic TRAIL was downregulated. Although these studies were undertaken primarily to confirm an impact of Wnt5A on intracellular signaling, the diverse modifications observed suggest the possibility that Wnt5A induces extensive reprogramming of DC-signaling networks. Future studies will be required to define specific pathways involved in the unique DC responses (e.g., IL-10 induction, versus suppression of TLR-mediated activation) induced by Wnt5A. It was perhaps surprising that Wnt3A and Wnt5A both condition DCs for tolerogenesis. In most cellular systems, as in DCs, Wnt3A acts through the canonical pathway, inhibiting Gsk3β and inducing downstream β-catenin accumulation, whereas Wnt5A activates noncanonical signaling and can even antagonize the canonical pathway, such that the two Wnts frequently have opposing functions (24). Indeed, although Wnt3A acting through β-catenin is anti-inflammatory for macrophages (8), Wnt5A can be either proinflammatory (9) or anti-inflammatory (10). Similarly, Wnt5A inhibits, whereas Wnt3A promotes, cDC development from mouse and human bone marrow (6), and Wnt3A and Wnt5A often display opposing roles in developing T and B cells (5). Although the two Wnts trigger distinct responses in differentiated DCs as well, they nonetheless both induce immune regulatory phenotypic features and suppress the proinflammatory DC response to the majority of TLRs. These shared immune suppressive effects on DCs suggests a unique importance for tolerogenic immune regulation through Wnt–DC interactions. This concept is further supported by the fact that Wnt5A, which in other cell systems counteracts Wnt3A/canonical Wnt signaling, had no effect on Wnt3A-induced β-catenin translocation on Wnt3A stimulation of VEGF in DCs. Consistent with our findings, Hack et al. (47) recently reported that Wnt5A suppresses human blood pDC activation by CpG. Together with this recent report, our findings demonstrate a direct effect of Wnt proteins on differentiated tissue DCs, confirming the hypothesized role for canonical Wnts in inducing DC tolerogenesis but also contrasting DC responses to canonical versus noncanonical Wnts. Previous studies of β-catenin–dependent mechanisms in immune tolerance and of Wnt effects on in vitro development of DCs from monocytes provided the rationale for assessing the role of Wnts in DC function. Two studies showed that disruption of E-cadherin–dependent cell clustering of immature in vitro bone marrow–derived DCs resulted in a mature (costimulatory moleculehigh MHCIIhigh CCR7+) tolerogenic phenotype, the induction of which involved β-catenin (12, 13). Cluster disruption–induced DCs failed to secrete inflammatory cytokines (IL-6, TNF-α, IL-12p40, and IL-1α) compared with bacteria-stimulated DCs, much like the Wnt-stimulated DCs described in this study, and they generated a tolerogenic, rather than immunogenic, T cell response (12). However, unlike Wnt5A, cluster disruption of DCs did not induce IL-10 secretion by DCs, and DCs matured by prior cluster disruption displayed decreased levels of IL-10 in response to secondary LPS stimulation (12). Thus β-catenin activation through disruption of cadherin-mediated adhesion, at least in DCs generated in vitro, results in a DC phenotype distinct from that induced by Wnt treatment of DCs, as shown in this study. Although noncanonical Wnts have not been studied in the context of differentiated cDC functions, Valencia et al. (48) showed that Wnt5A altered the process of DC differentiation from human monocytes: inclusion of Wnts in monocyte cultures with GM-CSF and IL-4 resulted in DCs with an immature tolerogenic phenotype, displaying reduced levels of proinflammatory cytokines but (in contrast to our results) also failing to upregulate costimulatory molecules MHCII and CCR7 in response to TLR ligands. It is noteworthy that the tolerogenic effect on DC differentiation from monocytes was mostly limited to Wnt5A and was not shared by Wnt3A. Moreover, the fact that inclusion of Wnts during the first 24 h of the 6-d differentiation culture was sufficient to generate the tolerogenic end-stage DC phenotype suggests that Wnt signaling at the early monocyte stage, rather than at a later DC stage, was responsible for Wnt-mediated modulation in that study. Therefore, the difference in the induced DC phenotypes and Wnt3A/Wnt5A responses reported in this article compared with those reported by Valencia et al. (48) could reflect differential and cell type–specific Wnt signaling/Wnt effects in monocytes versus DCs. Indeed, Wnt5A displayed proinflammatory effects in the differentiating monocyte system: supernatants of Wnt5A-treated monocytes contained high levels of IL-6 compared with control cultures (48), which is in line with previous reports of Wnt5A’s effects on macrophages (9) but is in clear contrast to our observation of its anti-inflammatory effects on differentiated tissue DCs. Finally, elegant studies by Manicassamy et al. (11) showed that mice with a selective DC deficiency in β-catenin display enhanced sensitivity to chemically induced colitis (dextran sulfate sodium), associated with increased production of inflammatory cytokines and a deficiency in DC IL-10 and TGF-β production. In combination with our finding that Wnt3A triggers β-catenin activation and TGF-β secretion in DCs, the demonstrated importance of DC-intrinsic β-catenin signaling to immune tolerance in vivo provides strong support for the proposed role of Wnts in regulating DC responses and maintaining tolerance under homeostatic conditions. Interestingly, Wnt expression is increased during infection and inflammation: Wnt5A is upregulated in sepsis (9), in granulomas of Mycobacterium tuberculosis patients (7, 8), and in bacterial periodontitis (49), and Wnts are increased or abnormally expressed in arthritis synovial tissue (50), atherosclerotic plaques (51), psoriatic or wounded skin (3, 52), and in inflammatory bowel disease (53). Our results suggest that induced Wnt proteins may modulate DC responses to limit inflammation after trauma or infection. In this context, it is interesting that WntD, a Drosophila Wnt protein that signals through noncanonical pathways, plays a critical role in resolving inflammatory responses in the fly (15), raising the possibility that Wnt regulation of immune response is a primordial mechanism for achieving immune homeostasis. However, Wnt5A is also upregulated in granulomas (7, 8), and Wnt–DC interactions could play a negative role in the persistence of chronic infections (e.g., tuberculosis). Finally, although tolerance to innocuous Ags and commensal organisms is advantageous, suppression of the immune response is undesirable in the context of tumor immunity. Wnts are frequently overexpressed in cancers (4), and their immune suppressive and tolerogenic effects on DCs could contribute to tumor immune evasion and cancer progression. We thank L. Rott for assistance with flow cytometry; Prof. Carlo Laudanna and Dr. Simone Zorzan for help with analysis of Kinexus data; the Immunologic Genome Consortium (http://www.Immgen.org); G. Dranoff for the Flt3L-expressing B16 melanoma line; the Stanford Immune Monitoring Core for Luminex assays; and Robert Coffman, Katharina Lahl, Brian Zabel, and Ruizhu Zeng for critical review of the manuscript. C.O. and M.L. performed the experiments and C.O., M.L., and E.C.B. designed the experiments, analyzed the data, and wrote the manuscript. This work was supported by Grants R37-AI047822, R01-AI072618, R01-DK084647, R01-CA169354, and RC1-AI087257 from the National Institutes of Health and a merit award from the Department of Veterans Affairs (to E.C.B. ), as well as by the Stanford Digestive Disease Center FACS Core facility under Grant DK56339. C.O. was supported by fellowships from the Wenner–Gren Foundation and the Crohn’s and Colitis Foundation. M.L. was a recipient of fellowship support under National Institutes of Health Training Grants 5 T32AI07290 and T32CA09151. 2007. Recognition of microorganisms and activation of the immune response. Nature 449: 819–826.
. 2003. Dendritic cell function in vivo during the steady state: a role in peripheral tolerance. Ann. N. Y. Acad. Sci. 987: 15–25.
. 2006. Wnt signaling induces epithelial differentiation during cutaneous wound healing. BMC Cell Biol. 7: 4.
. 2005. Wnt signalling in stem cells and cancer. Nature 434: 843–850.
. 2008. WNT signalling in the immune system: WNT is spreading its wings. Nat. Rev. Immunol. 8: 581–593.
. 2009. Notch and wingless signaling cooperate in regulation of dendritic cell differentiation. Immunity 30: 845–859.
. 2006. The Wingless homolog WNT5A and its receptor Frizzled-5 regulate inflammatory responses of human mononuclear cells induced by microbial stimulation. Blood 108: 965–973.
. 2010. Frizzled1 is a marker of inflammatory macrophages, and its ligand Wnt3a is involved in reprogramming Mycobacterium tuberculosis-infected macrophages. FASEB J. 24: 4599–4612.
. 2008. 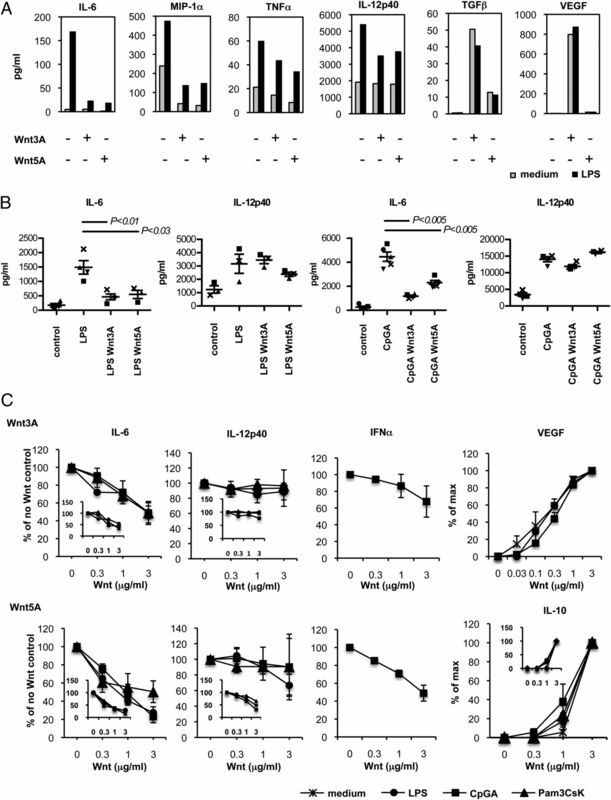 Wnt5A/CaMKII signaling contributes to the inflammatory response of macrophages and is a target for the antiinflammatory action of activated protein C and interleukin-10. Arterioscler. Thromb. Vasc. Biol. 28: 504–510.
. 2012. Wnt5a induces a tolerogenic phenotype of macrophages in sepsis and breast cancer patients. J. Immunol. 188: 5448–5458.
. 2010. Activation of beta-catenin in dendritic cells regulates immunity versus tolerance in the intestine. Science 329: 849–853.
. 2007. Disruption of E-cadherin-mediated adhesion induces a functionally distinct pathway of dendritic cell maturation. Immunity 27: 610–624.
. 2011. 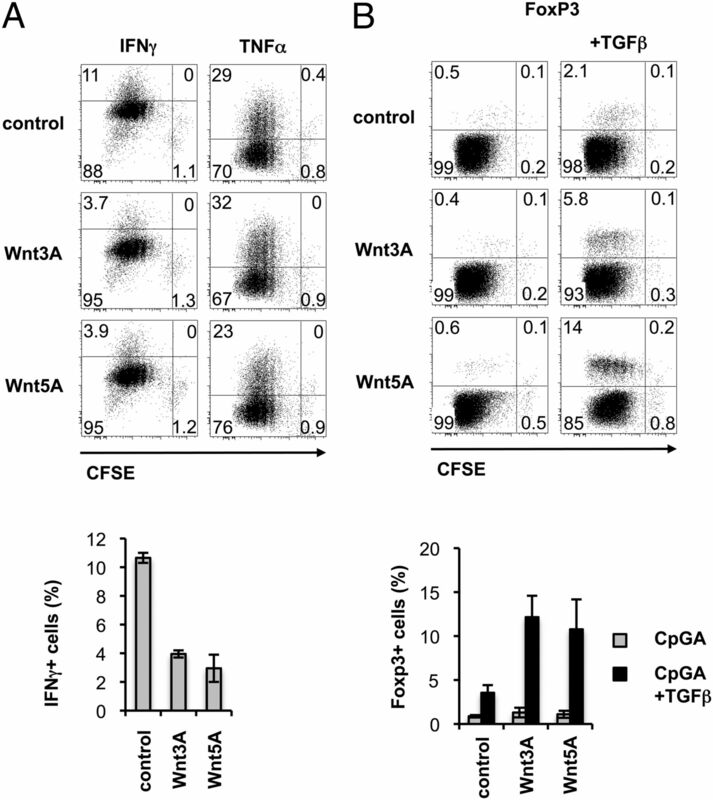 TGF-β suppresses β-catenin-dependent tolerogenic activation program in dendritic cells. PLoS ONE 6: e20099.
. 2012. Heterotrimeric G protein-dependent WNT-5A signaling to ERK1/2 mediates distinct aspects of microglia proinflammatory transformation. J. Neuroinflammation 9: 111.
. 2005. WntD is a feedback inhibitor of Dorsal/NF-kappaB in Drosophila development and immunity. Nature 437: 746–749.
. 2000. Differences in dendritic cells stimulated in vivo by tumors engineered to secrete granulocyte-macrophage colony-stimulating factor or Flt3-ligand. Cancer Res. 60: 3239–3246.
. 2002. The development of murine plasmacytoid dendritic cell precursors is differentially regulated by FLT3-ligand and granulocyte/macrophage colony-stimulating factor. J. Exp. Med. 195: 953–958.
. 2003. Analysis of microarray data using Z score transformation. J. Mol. Diagn. 5: 73–81.
. 2012. Deciphering the transcriptional network of the dendritic cell lineage. Nat. Immunol. 13: 888–899.
. 1996. Production of vascular endothelial growth factor by human tumors inhibits the functional maturation of dendritic cells. Nat. Med. 2: 1096–1103.
. 2012. VEGF directly suppresses activation of T cells from ovarian cancer patients and healthy individuals via VEGF receptor Type 2. Int. J. Cancer 130: 857–864.
. 2006. Vascular endothelial growth factor blockade reduces intratumoral regulatory T cells and enhances the efficacy of a GM-CSF-secreting cancer immunotherapy. Clin. Cancer Res. 12: 6808–6816.
. 2005. Essential role for CD103 in the T cell-mediated regulation of experimental colitis. J. Exp. Med. 202: 1051–1061.
. 2009. Towards an integrated view of Wnt signaling in development. Development 136: 3205–3214.
. 2007. Wnt5a inhibits canonical Wnt signaling in hematopoietic stem cells and enhances repopulation. Proc. Natl. Acad. Sci. USA 104: 15436–15441.
. 2007. Wnt5a secretion stimulated by the extracellular calcium-sensing receptor inhibits defective Wnt signaling in colon cancer cells. Am. J. Physiol. Gastrointest. Liver Physiol. 293: G403–G411.
. 2011. Wnt3a induces myofibroblast differentiation by upregulating TGF-β signaling through SMAD2 in a β-catenin-dependent manner. PLoS ONE 6: e19809.
. 2005. Toll-like receptor-mediated cytokine production is differentially regulated by glycogen synthase kinase 3. Nat. Immunol. 6: 777–784.
. 2010. Global regulator SATB1 recruits beta-catenin and regulates T(H)2 differentiation in Wnt-dependent manner. PLoS Biol. 8: e1000296.
. 2009. Anti-inflammatory and pro-inflammatory roles of TGF-beta, IL-10, and IL-22 in immunity and autoimmunity. Curr. Opin. Pharmacol. 9: 447–453.
. 1997. Interleukin 10 prevents cytokine-induced disruption of T84 monolayer barrier integrity and limits chloride secretion. Gastroenterology 113: 151–159.
. 1989. Transforming growth factor beta specifically enhances IgA production by lipopolysaccharide-stimulated murine B lymphocytes. J. Exp. Med. 170: 1039–1044.
. 1989. Transforming growth factor beta induces IgA production and acts additively with interleukin 5 for IgA production. J. Exp. Med. 170: 1415–1420.
. 2002. Generation ex vivo of TGF-beta-producing regulatory T cells from CD4+CD25− precursors. J. Immunol. 169: 4183–4189.
. 2003. Conversion of peripheral CD4+CD25− naive T cells to CD4+CD25+ regulatory T cells by TGF-beta induction of transcription factor Foxp3. J. Exp. Med. 198: 1875–1886.
. 2011. Enhancement of basic fibroblast growth factor-stimulated VEGF synthesis by Wnt3a in osteoblasts. Int. J. Mol. Med. 27: 859–864.
. 2010. The pathogenic role of the canonical Wnt pathway in age-related macular degeneration. Invest. Ophthalmol. Vis. Sci. 51: 4371–4379.
. 2011. Paneth cells constitute the niche for Lgr5 stem cells in intestinal crypts. Nature 469: 415–418.
. 2005. Expression pattern of Wnt signaling components in the adult intestine. Gastroenterology 129: 626–638.
. 2006. Reciprocal developmental pathways for the generation of pathogenic effector TH17 and regulatory T cells. Nature 441: 235–238.
. 2002. NF-kappaB regulation in the immune system. Nat. Rev. Immunol. 2: 725–734.
. 2012. Dendritic cell-specific ablation of the protein tyrosine phosphatase Shp1 promotes Th1 cell differentiation and induces autoimmunity. J. Immunol. 188: 5397–5407.
. 2005. Dok-1 and Dok-2 are negative regulators of lipopolysaccharide-induced signaling. J. Exp. Med. 201: 333–339.
. 2003. Role of the phosphatidylinositol 3 kinase-Akt pathway in the regulation of IL-10 and IL-12 by Porphyromonas gingivalis lipopolysaccharide. J. Immunol. 171: 717–725.
. 2009. The induction of IL-10 by zymosan in dendritic cells depends on CREB activation by the coactivators CREB-binding protein and TORC2 and autocrine PGE2. J. Immunol. 183: 1471–1479.
. 2012. Reciprocal regulation of protein kinase C isoforms results in differential cellular responsiveness. J. Immunol. 188: 2328–2337.
. 2012. Wnt5a inhibits the CpG oligodeoxynucleotide-triggered activation of human plasmacytoid dendritic cells. Clin. Exp. Dermatol. 37: 557–561.
. 2011. Wnt5a skews dendritic cell differentiation to an unconventional phenotype with tolerogenic features. J. Immunol. 187: 4129–4139.
. 2012. Modulation of Wnt5a expression by periodontopathic bacteria. PLoS ONE 7: e34434.
. 2000. Expression and function of wingless and frizzled homologs in rheumatoid arthritis. Proc. Natl. Acad. Sci. USA 97: 2791–2796.
. 2008. Wnt5a is expressed in murine and human atherosclerotic lesions. Am. J. Physiol. Heart Circ. Physiol. 294: H2864–H2870.
. 2010. Evidence for altered Wnt signaling in psoriatic skin. J. Invest. Dermatol. 130: 1849–1859.
. 2008. Wnt pathway-related gene expression in inflammatory bowel disease. Dig. Dis. Sci. 53: 1013–1019.